goodbye, professor snape | do you have stars in your mouth? I don’t have many stories to share about Alan Rickman because, truthfully, I was terrified of him as Snape and throughout the course of the films I always gave him a wide berth. But I wanted to share the brief but significant encounters I had with him. He was probably the only cast member who met my fangirl expectations because everybody else broke character to be nice to me and make me feel welcome to the Potter family, and also to be themselves, while he remained impassively, Snape. So I assumed he WAS Snape and made myself small whenever he went gliding past in those big, shadowy black robes. Among the only people who didn’t keep their distance were the throngs of children he used to bring to lunch in the canteen. It was odd that any of the adult actors would lunch in the canteen, but odder still that Snape would, surrounded by a group of giddy little girls and boys. I was told that they were his friends’ children and that NO, I would not be allowed to bring that many guests, and nor would anyone but that nobody fancied the task of telling Alan he shouldn’t invite his friends’ eager young children to the studio on a weekly basis. Thus we all enjoyed the bizarre sight of Snape in his all-black, bat-like glory sitting head and shoulders above a gang of unnaturally unfazed children. 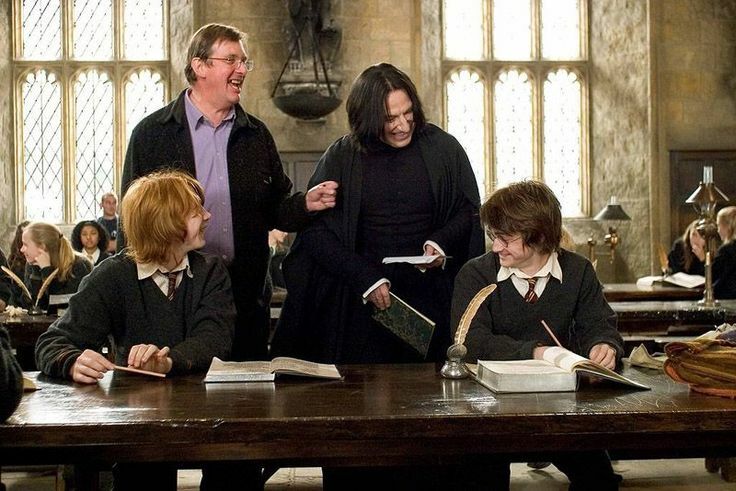 For me, these glimpses of Snape chatting quite amiably to young people was the only hint that there was an Alan in there too and that he was in fact very, very nice. It wasn’t until a few years later that I had the chance to meet Alan as himself. It was at a charity dinner and our nameplates were next to each other. I started to panic quietly and I even asked another guest would he like to take my seat! But an organiser insisted we sit at our assigned seats and I steeled myself for the most awkward dinner conversation of my life!! I sat down and much to my shock he greeted me warmly and by name. My real name! That put me at ease and after that I was quite happy for him to feign intense interest in his dinner plate rather than make casual chit-chat with me. But he did keep talking to me, asked lots of questions and seemed genuinely interested in my interests and projects. The conversation got round to acting quickly and at the time I was stressing about the pressure I felt to already be a successful actress and that I’d run out of time to make mistakes. I was aware I was talking about myself so I kept trying to shift the conversation back to him but he just wanted to help. He told me he hadn’t known what he’d wanted to be out of school, that he’d gone to art school first to be a graphic artist and had come to acting a few years later when he applied for drama school. As an actress, already having to lie about my age at 24, it seems mad that Alan only found his vocation and began his acting journey at 26 and turned out to be…Alan Rickman. But when I told him that I was worried if I didn’t figure myself out quickly I would miss the most important opportunities and never get them back, he simply told me that I was focusing on the wrong thing. He said not to worry about getting ‘there’ and instead to focus on feeding my soul and following my heart from place to place. And then he gave me the loveliest acting advice I’ve ever gotten. ‘People think that they’re watching this’ he said waving his hand in front of his face, ‘but really they’re watching this’ and he pounded his fist on his heart centre. After dinner, I thanked him for the advice though for some reason he rejected the notion that he’d given me any advice (I don’t know why) but whatever it was, it truly stuck with me and it made me start living differently, being more in tune with my heart, listening and following its rhythms and wishes and surrendering the need to control my life. After that meeting I thought about him a lot and what a truly lovely, kind, generous person he was. For someone as established, wise and revered as he, the greatest gift you can give someone is your full attention and presence in the moment. Most people of his measure of talent and intellect are extremely busy and are anxious for you to know this. You start to talk to them and their eyes are already darting to the other corners of the room, their fingers reaching for their phone where a million more interesting people are pinging away at their inbox. They can’t afford to spend their precious time and entire mental facilities just on you, so mostly they just give you a bit, just for a few minutes. But Alan Rickman was not that at all. In the hour I sat with him, he managed to be completely present, kind, attentive and curious about someone who did not expect or look for that from him. It says a lot about him, how nice a person he was and what discipline it must have taken to stay in character so much. It must have been hard to play Snape and to have to alienate himself from everyone. It must have been hard to have to stop smiling at people. And uncomfortable to make others so uncomfortable. There aren’t that many actors that would go to such lengths for the integrity of their character. There were deep and heart-breaking reasons why Snape didn’t smile, why he is such a loner and the most stubbornly emo adult ever. I so appreciate the fact that he cared that much about his character, that he didn’t dismiss Harry Potter as a ‘kids film’, a handy job and a sizeable paycheck. He loved and honoured Snape the way all beloved characters deserve and he made the Harry Potter world that much more real for us. I can’t quite believe he’s not here anymore. I somehow still think actors are immortal like the characters they play but then they leave us. Please honour his memory and what he gave us by talking about and sharing stories and continuing to celebrate his legacy so then he will be here, as we like to say, ‘Always’. 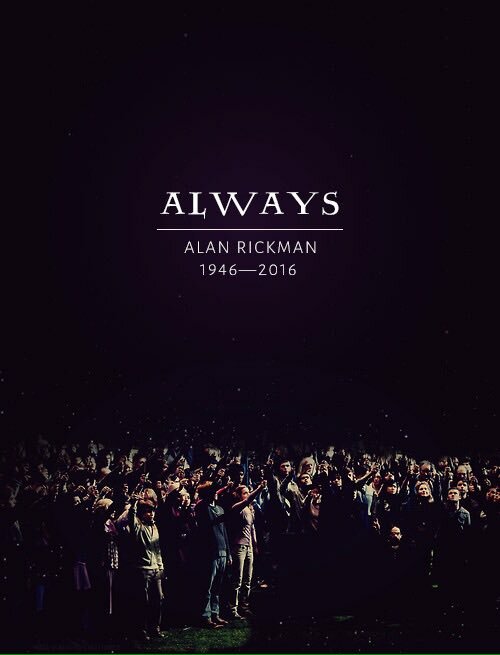 Goodbye, Alan Rickman. I’m grateful and honored to have witnessed your brilliance. Thanks for sharing your gift to the world. This entry was posted in writings on the wall and tagged Harry Potter, Professor Snape. Bookmark the permalink.